WASHINGTON (AP) — Senate Democrats on Monday blocked a Republican bill that would have threatened prison for doctors who don’t try saving the life of infants born alive during abortions. The measure seemed doomed from the start but offered the GOP a chance to appeal to conservative voters. The vote was the latest instance in which Republicans have tried to go on offense on the issue and put Democratic abortion-rights lawmakers in an uncomfortable position. Supporters said the measure presented lawmakers with a simple, moral choice. 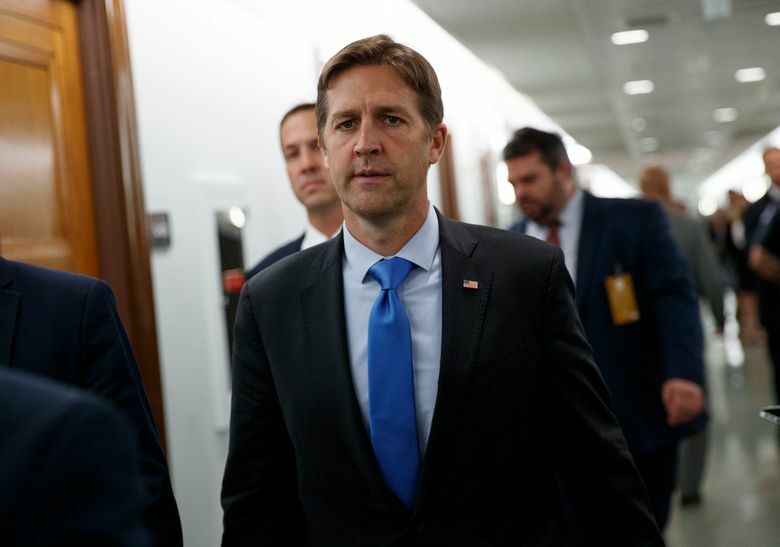 “I want to ask each and every one of my colleagues whether or not we’re OK with infanticide,” said the measure’s chief sponsor, Sen. Ben Sasse, R-Neb. Opponents, noting the rarity of such births and citing laws already making it a crime to kill newborn babies, said the bill was unnecessary. They said it is part of a push by abortion opponents to curb access to the procedure and intimidate doctors who perform it, and said late-term abortions generally occur when the infant is considered incapable of surviving after birth. Senators voted 53-44 for Sasse’s bill — seven votes short of the 60 needed to end Democratic delaying tactics aimed at derailing the measure. Democratic Sens. Bob Casey of Pennsylvania, Doug Jones of Alabama and Joe Manchin from West Virginia were the only lawmakers to cross party lines as Democrats demonstrated anew that even in the minority, they can derail abortion-related bills. Several dozen House Republicans, led by Minority Leader Kevin McCarthy, R-Calif., stood on the Senate floor during the vote, just as a contingent of House Democrats did last month during a crucial vote on ending the government shutdown. Republicans control the Senate by 53-47. Only 1 percent of all abortions occur after 21 weeks of pregnancy, according to the Guttmacher Institute, which supports abortion rights. Abortions during the final weeks are rarer still. Doctors’ and abortion-rights groups say it is extremely unusual for live infants to be born during attempted late-term abortions, which they say usually occur when the baby is extremely deformed or deemed unable to survive after birth. In such cases, families sometimes decide they want to induce labor so they can spend time with the infant before it dies. “It only happens in instances in which we know that the baby will not ultimately survive, and a choice has been pre-made to provide just comfort care” to the baby so the parents can be with it, said Dr. Colleen McNicholas, a fellow with the American College of Obstetricians and Gynecologists. If an infant is born alive during an abortion, Sasse’s bill would require doctors to render “the same degree” of care used for any birth. The baby would have to be immediately sent to a hospital. Republicans in the Democratic-run House plan to try forcing a vote on a similar measure this spring. They will employ a seldom-used tactic, a petition requiring signatures from most House members to succeed. The GOP is expected to fall well short of the 20 Democratic supporters they’d need. Republicans, eager to put congressional Democrats from swing states in an uneasy political spot, have been pouncing on the issue since it arose earlier this year in Virginia and New York. Democratic Virginia Gov. Ralph Northam, a pediatric neurologist, spoke favorably in January about state legislation to ease restrictions on late-term abortions. He said “a discussion would ensue” between doctors and the family over what to do if an infant is born who is badly deformed or incapable of living. Northam has since faced pressure to resign over a racist photo that appeared in his 1984 medical school yearbook. Trump has criticized a new abortion law in New York that permits abortions of a viable fetus after 24 weeks of pregnancy if the mother’s life is in danger — codifying conditions specified by U.S. Supreme Court rulings.